Let me take you back. Back to the spring of 1991, when I was a 14 year old kid (not yet pimply faced) who was well on his way to becoming immersed in the world of rock. I was listening to Zeppelin and The Beatles and The Doors and Neil Young. I was growing my hair long in the back (badly) and learning how to play bass guitar (not as badly). It was around this time that my good friend at the time, one Corey Diamond (a massive Rush fan who introduced me to the brilliance of one Neil Peart), called me on Monday night (it feels like it was a Monday), suggesting we go down to the Toronto Skydome and see the band Yes. I declined, he was persistent, and I declined again, even though the tickets were a cheap $10.70. “You don’t know ‘Roundabout’?” he responded with a degree of shock. And so I skipped out on the Union tour, which featured 8 reunited members of the band that defines progressive rock. It is hands down my biggest concert regret of all time. Within weeks of the show I started buying up albums by Yes at a rapid pace. I hoped that the tour would make a second trip back to Toronto during the summer leg, but it wasn’t to be. And while I’ve seen Yes each time they’ve returned to the city ever since (arenas and amphitheaters and theaters), I never got to see Anderson, Bruford, Wakeman, Howe, Squire, White, Rabin and Kaye all together. Over the subsequent years, I did find footage and audio of what I missed. In 1992, I spent $60 at Edward’s Record World on a double cd bootleg of a Wembley Arena show (‘Say Yes’ was the title) and could have worn it out until I read that the tapes had been sped up so that the entire show could fit on two discs. I never listened to it the same way again. I bought a VHS bootleg of a show somewhere in the States (Pittsburgh? Boston?) that I found at a record show. When I got home I was so excited to watch it, only to discover the tape ran out after 2 hours, leaving me missing about 35 minutes of the gig and with a feeling of disapointment in my stomach. And while my wife insists I shouldn’t tell you this, I’ll admit to watching that VHS tape over and over, often hoping that the rest of the show would magically appear. I watched and rewatched footage from the band in Denver I recorded off of ABC’s In Concert Friday night tv show and marvelled at Rick Wakeman’s prog rock keyboards he added to the end of ‘Owner’. Years later I bought a bootleg VHS tape of a show at the Shoreline Amphitheatre that was officially released in Japan years later. Enter Ebay in the new millenium and I repurchased the Shoreline show on DVD, this time packaged with a complete performance in the round from Denver, Colorado. They were still bootlegs, but it was something. Now it’s 20 years later and after countless underground purchases and endless dreams, a live record of the Union Tour has finally been officially released in a gorgeous 2DVD/2 CD collection. It features that Shoreline show I’ve bought twice already. It’s got the bootleg Denver show, too. It also has the very first show of the Union tour (a bootleg performance, captured on shaky multi-cameras and hugely historical). 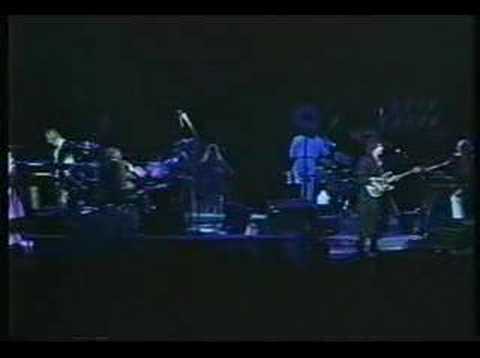 We’re talking about nearly 7 hours of video material, along with a soundtrack to Shoreline concert. Throw in some backstage passes and a replica of the original tour program and you’ve pretty much got as good a package I’d ever hope for. With a young family and a goal to curtail my spending on the non-essentials, you may wonder why I’d spend about $56 on material I mainly already had. Truth is, I’ve waited for something official from Yes’ Union tour all these years. It’s all well and good to find and buy bootlegs, but this is an official release. That means the band approved of it and they’ll get royalties. It seems worth the money. And the packaging really is well done. I can’t believe it’s been 20 true summers since I fell in love Yes. It feels like only yesterday that I was sitting in a friends basement with my imitation Rickenbacker bass, playing ‘The Fish’ over and over. Now I’m sitting with my 7 month old daughter on my lap, singing along to ‘I’ve Seen All Good People’. But it’s the music that sticks with you that matters the most. Yes has stuck with me. And while I don’t think the Union Live collection is for everyone, if you’ve had an interest or you were there to see it all happen, this set is a keeper. If you’re interested, you can pick up this limited edition set here. With roughly 3000 reportedly sold already, it’s nice to know I wasn’t the only one waiting for this. And to my old friend Corey, thanks for introducing me to the magic of prog rock. I blame you. I saw Yes in Detroit in 1977. Some guy wandered into a store I was working in and sold me two tickets. They turned out to be front row stage-left, and I could not believe how good this band was. During Close to the Edge, Steve Howe played two different guitars, one on a stand and one in his hand. Wakeman was playing several different keyboards at once. They are without a doubt one of the finest live bands, and with most intricate and complex instrumentation, I've ever witnessed. Hope some incarnation comes back around for one more cash grab tour.